Five years after coming to the U.S. from Guatemala, Victor De Leon was still working as a janitor. When he asked his boss what he needed to do to move up, he got a two-word response: "Learn English." Victor took basic ESL classes at Job Train and at Sequoia Adult School. In Fall 2017 he transferred to Cañada College to take more advanced ESL classes. Upward Scholars pays for his books and parking pass. Soon after he started learning English, Victor got a job as a dishwasher. Next he got promoted to his current job as an assistant server. His goal is to be a server, where he can make up to $30 an hour. "I know I can do it," he says. "I just need to have support from Upward Scholars and a little more time." At age 28, Upward Scholars student Lorenza Villanueva came to the U.S. from Mexico to escape from an abusive husband. For the first several years here, she devoted all her time to working and caring for her young daughter. But when her daughter was a junior in high school, Lorenza's life went in an entirely different direction. First, Lorenza earned her GED, in Spanish, from Sequoia Adult School. 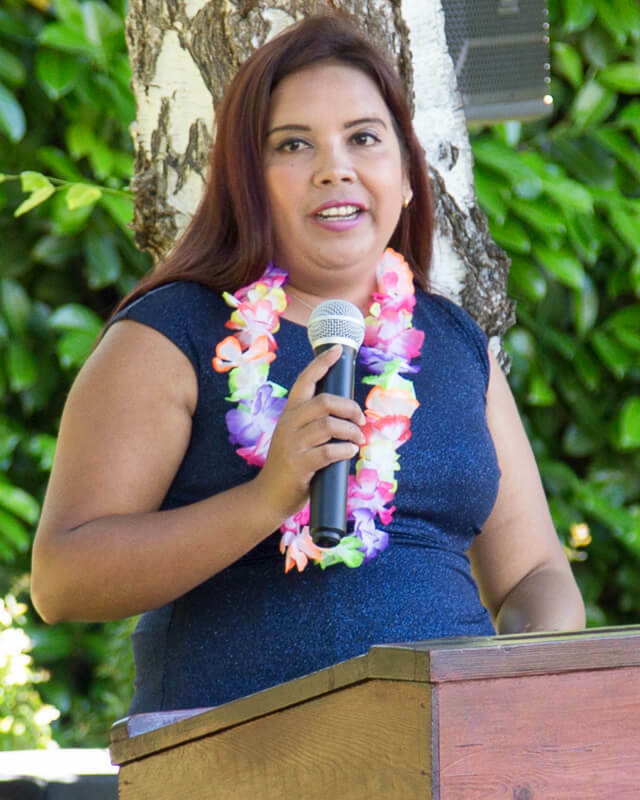 She then completed Cañada's rigorous ESL sequence in just two years and enrolled in the College for Working Adults, a program for students working full-time. Lorenza has been on Cañada Colege's Dean's list three times. In addition to support from Upward Scholars, she has received a scholarship from the San Mateo Community College Foundation for the past two years. In 2020, Lorenza is scheduled to earn associate degrees in economics, psychology, and interdisciplinary studies. Then she plans to transfer to a university to study business administration. Lorenza's boundless enthusiasm has made her a frequent spokesperson for our work. You can watch her recent speech at the Palo Alto Community Fund Grant Reception here. Alejandro Avendaño quit high school near the end of his senior year when his future wife got pregnant and he needed to support his new family. A few years later, he went back to school, this time to Sequoia Adult School, to complete the classes he needed for his high school diploma. His next step was the College of San Mateo where he's majoring in criminal justice administration. His dream is to be a police officer. Alejandro got one step closer to that dream in August 2017 when he landed a job as a community service officer for the San Mateo County Sheriff's Office. Now, with help from his Upward Scholars tutor, he's studying for the exam he must pass to enter the Police Academy. Meanwhile he continues to work towards his associate degree at CSM. "Until I heard about Upward Scholars, I didn't think I could afford to go to college," Alejandro says. "Upward Scholars paid for my books and for my parking pass. And they gave me an amazing tutor who has shown me that anything is possible." You can watch Alejandro tell his story here. "The day English changed my life"
Upward Scholars student Marta Marcos remembers the day English changed her life. A mother of two, Marta started volunteering at her daughter's school soon after she and her family arrived in the U.S. from El Salvador. Knowing how much Marta liked kids, a friend told her about an opening for an assistant pre-school teacher. Marta applied for the job. "I was so scared," Marta recalls. "The interview was in English and my English was not good." But Marta nailed the interview and got the job, a victory she attributes to the ESL classes she took at Sequoia Adult School and Cañada College and the support she received from Upward Scholars. Marta has completed all her ESL college classes and is now enrolled in Early Childhood Education (ECE) classes. Her plan is to get an associate degree in ECE and then transfer to a four-year university to get her elementary teaching credential. You can watch Marta tell her story here.